These reports from contemporary trade papers give detailed information on the construction and laying of this cable. The Proposed Bermuda-Halifax Cable: Its Usefulness For Weather Predictions. The announcement made by the British Postmaster-General (says the New York Herald), that the Government intended to lay a submarine cable between Bermuda and Halifax, will be good news to all Atlantic seamen and all American and European meteorologists. Bermuda is a natural observatory for watching hurricanes emerging from the tropical ocean and threatening to assail the United States, or to advance north-eastwardly from the Gulf Stream into the transatlantic steamer tracks, and subsequently to burst upon the shores of Europe. Of course an observer at Bermuda cannot see with the naked eye what a Gulf Stream storm is doing, or determine by ocular demonstration what its course will be. But by watching the fluctuations of the barometer at this mid-Atlantic station, and by reporting them by cable to America and Europe, meteorologists on either continent will be enabled to feel the pulse of the storm and to determine more accurately its intensity and its future movements. For purposes of weather and storm forecasting in our Atlantic States, therefore, weather cablegrams from Bermuda will be invaluable. Halifax and Bermudas Cable.—On Wednesday, at the invitation of the chairman and directors of the Halifax and Bermudas Cable Company, Limited, a number of gentlemen visited the steamship “Westmeath” at Greenhithe, which is about to proceed to Halifax and Bermuda for the purpose of laying the cable. The party was conveyed by a special steamer from Westminster Bridge, and among those present were Sir Alexander Armstrong, K.C.B. (chairman of the company), Mr. Isaacs, M.P. (deputy chairman), Mr. Sydney Gedge, M.P. (chairman of Henley’s Cable Company, by whom the cable has been made), Mr. Latimer Clark, C.E., Mr. Graves, C.E. (engineer-in-chief to the post office), Mr. James Hay (secretary), Mr. Bristow, Mr. Glynn, Mr. C. Seymour Grenfell, and Mr. Barnard. The visitors were conducted over the vessel by Captain Stiffe, the engineer-in-chief, who explained the various points of interest in connection with it. The carrying capacity of the vessel is about 4,500 tons, and everything included it has about 4,000 tons on board. The cables are coiled in circular iron tanks, the largest of which holds 450 knots. The cable, which after severe testing has been passed by the Post Office authorities, is kept under water the whole time. All the latest machinery for paying out and testing the cable has been fitted up on board, but in the main the arrangements for picking up and paying out are the same as those adopted by Mr. Henley for the Persian Gulf cable in 1863. The rate of paying out will be at least seven knots. The vessel starts to-day, and proceeds to Bermuda to take some deep-sea soundings on the intended line of the cable. She will lay the shore end from Halifax, and will then proceed to pay out all the deep-sea portion. It is believed that the greatest depth will not exceed 3,000 fathoms. In the event of accident, arrangements exist for recovering the cable at that depth and picking it up again. According to present expectation the laying of the cable will be completed by the end of June. Altogether 874 knots of cable, weighing upwards of 2,000 tons, have been made, but the length to be laid will probably not exceed 830 knots. 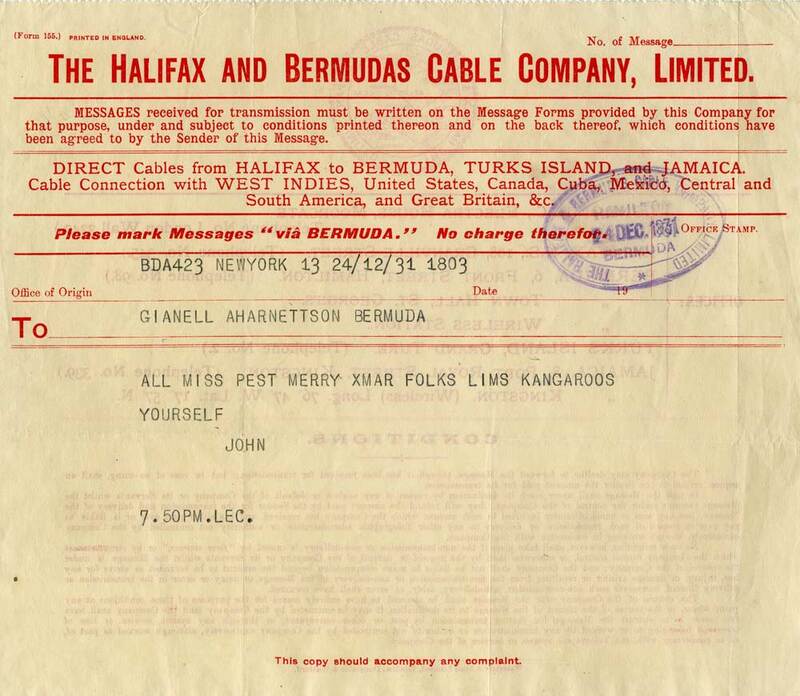 Mr. R E Peake, of Messrs. Clark, Forde and Taylor, represents the Halifax and Bermudas Cable Company. Messrs. W. T. Henley’s Telegraph Works Company, Limited, are just proceeding with the manufacture of another submarine telegraph cable, nearly 1,000 miles in length. Halifax and Bermudas Cables.—The s.s. “Westmeath,” with the Halifax and Bermudas cable on board, arrived off Bermuda on the 7th inst., and, having completed the necessary soundings, proceeded to Halifax, which port she reached on the 16th inst., and will at once commence to lay the cable. Bermuda Cable.—The new cable between Halifax and Bermuda was laid this week. Bermuda, now connected with the rest of the world by telegraph cable, is a group of islands lying six hundred miles east by south from Cape Hatteras, in latitude 32 deg. 20 min. north, and in longitude 64 deg. 50min. west. There are two towns, St. George’s and Hamilton, the latter being the centre of the colonial government. The whole population numbers about fifteen thousand, of whom about one-third only are whites. It is one of Great Britain’s naval stations, having large docking facilities and ample plant for the repair of modem war ships. The cable company is an English joint stock concern known as the Halifax and Bermudas Cable Company, Limited, its office being at No. 33 Old Broad street, London. The capital of the company consists of £170,000. The steamer “Westmeath,” which has just laid the cable, was fitted with the latest and most improved machinery for cable work. After landing the stores for the equipment of the Bermuda station, the “Westmeath” landed the shore end there and paid out a short. distance seaward. The cable was then cut and buoyed and the cable ship proceeded to Halifax, taking soundings on the way. At Halifax, where the “Westmeath” arrived June 18, the northern shore end was landed, and the ship started paying out toward Bermuda on the 24th ult. The cable consists of five sizes—the Bermuda shore end, about six inches in diameter; the Halifax shore end, two “intermediates,” A and B, and the deep sea section. The cable conductor consists of a strand of seven copper wires, 120 pounds per knot, insulated with three alternate coatings of gutta percha and Chatterton’s compound, 150 pounds per knot. This core is covered with a serving of jute yarn steeped in preservative mixture applied wet and then whipped with three-thread jute yarn to keep the serving in place. The deep-sea cable is served with 16 galvanized homogeneous iron wires. The “intermediate A” is sheathed with 12 No. 8 (B.W.G.) and “intermediate B” with 12 No. 5 wires. The shore end consists of “intermediate A” sheathed with 12 strands of three No. 6 wires. The whole of the above is served with two coats of Russian hemp, laid on in opposite directions, and three coatings of bituminous compound, the first of which is put on next to the wires and the others over a layer of yarn. The approximate weight of shore end, “intermediate A,'' “intermediate B” and deep sea cables is 14, 5, 3 and 1 ton per knot respectively. The conductor resistance is 10.5 ohms per knot at 75 degrees Fahrenheit. The gutta percha resistance after 24 hours' immersion in water at 75 degrees is to be not less than 1,000 megohms per knot after one minute’s electrification. The instruments to be employed are the modified form of syphon recorder. The cable will be opened for general commercial business from 8 A.M. to 8 P.M., and the greatest amount of traffic is anticipated between New York and Bermuda. Arrangements are now being negotiated with all American, Canadian and European lines for a general interchange of business. The rate per word between Bermuda and Halifax will be 75 cents. The line is to be extended to Nassau and Jamaica, and thence to Progreso and Vera Cruz. Also a line will be laid from Bermuda to the Azores, and thence to Lisbon, Portugal. The Halifax and Bermuda Cable.—A cablegram has been received by the Halifax and Bermuda Cable Company from the ss. Westmeath, in lat. 35° 11 min., long. 64° 7 min., stating that at noon on the 29th inst. 623 knots of the cable had been paid out, and that the steamer was now well past the influence of the Gulf Stream. Weather fine and everything satisfactory. The cable was completed on Tuesday last, and Messrs. W. T. Henley’s Telegraph Works Company, Limited, are to be congratulated on the success they have met with in laying the new cable. A large number of soundings were taken, the bottom being found even and quite satisfactory; the greatest depth ascertained was 2,820 fathoms. The paying out of the cable was commenced on Wednesday, the 25th ult., and the ship arrived off Bermuda at noon on the 30th. The core is composed of seven copper wires stranded, weighing 120 lbs. per N.M., and of three coats of gatta percha, weighing 150 lbs. per N.M. The core is covered throughout with a serving of jute yarn, steeped in a preservative mixture and then whipped with 3-ply jute yarn. The conductor resistance is stated to be 10.5 ohms per N.M., at a temperature of 75° Fahrenheit; the dielectric resistance after 24 hours' immersion in water at the temperature of 75° Fahrenheit, was to have been not less than 1,000 megohms after one minute’s electrification. In the deep sea type the core is sheathed with 16 galvanised homo wires, each .099 of an inch in diameter; the outer covering consists of two coats of Russian hemp laid on in opposite directions, and three coats of bituminous compound. The weight of this type, wet in air, is about 1.8 tons per N.M. The sheathing for the light intermediate cable is composed of 12 galvanised iron wires, each .165 of an inch diameter; the outer covering is the same as in the deep sea type. The weight of this type, wet in air, is about 3.5 tons per N.M. The core, in the heavy intermediate type, is sheathed with 12 galvanised iron wires, each .220 of an inch diameter; outer covering same as before. This type weighs, wet in air, about 6 tons per N.M.
For the Bermuda shore end the core is first sheathed with 12 galvanised iron wires, each .165 of an inch diameter, a sufficient serving of jute and compound is then laid on, and this is then covered with an outer sheathing of 12 strands of three wires each, each wire .203 of an inch diameter. The external covering is the same as before. This type weighs about 19 tons, wet in air, per N.M. According to the Bermuda Royal Gazette, the Halifax shore end is of a lighter description, having only one sheathing, and weighing only about 10 tons per N.M. The Westmeath, a steamer chartered by Henley’s Telegraph Company for the laying of the cable, is a vessel of some 4,500 tons. She left the Thames on May 23rd, carrying 874 N.M. of cable. She was under the command of Captain Stonehouse, the engineer-in-charge being Captain Stiffe, late of the Indian Marine. Mr. Peake, of the firm Clark, Forde and Taylor, represented the Halifax and Bermudas Cable Company. The Westmeath anchored at Bermuda on the 6th June, and left on the 12th to sound along the route of cable, completing the soundings commenced by the I. The vessel arrived at Halifax on June 16th. It is stated that the soundings were taken 100 miles apart, except near the land, where they were made at close intervals. The deepest water found is said to have been 2,820 fathoms, with a bottom temperature of 34.4° Fahrenheit. The laying was commenced from the Halifax end on the 25th June, arriving off Bermuda on the 30th, the final splice being made on the 7th July, some difficulty having been experienced in the laying of the shallow water portion, light draught vessels being employed for the purpose. The total length laid was, we understand, about 850 N.M. The capital of the company is £120,000, in 4 ½ per cent. first mortgage debentures,and £50,000 in ordinary shares of £5 each. The English Government grants a subsidy of £8,100 per annum for 20 years. It is stated that considerable traffic will be obtained between Bermuda and New York, and that some revenue will arise from ships which, it is hoped, may make the Bermudas a port of call. We presume that some business beyond that which may proceed from casual winter visitors from the States, or from an occasional vessel in distress, is anticipated. No doubt the cable is of importance as connecting two British naval stations, but this fact does not necessarily imply a paying investment.